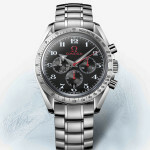 OMEGA has an unparalleled history in sports timekeeping. 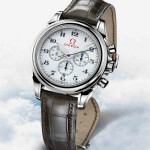 First named Official Timekeeper at the Olympic Games in Los Angeles in 1932, OMEGA’s expertise in sports timekeeping and ability to deliver precise and reliable results led to the company’s appointment as Official Timekeeper for a total of twenty-one Olympic Games over the course of the 20th century. 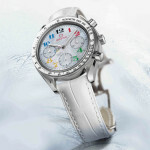 The Torino 2006 Olympic Winter Games mark the return of OMEGA to its historic role. 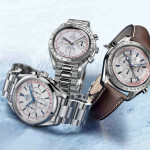 To celebrate, OMEGA presents the OMEGA Torino Olympic 2006 Collection, a series of three Limited Edition chronographs. 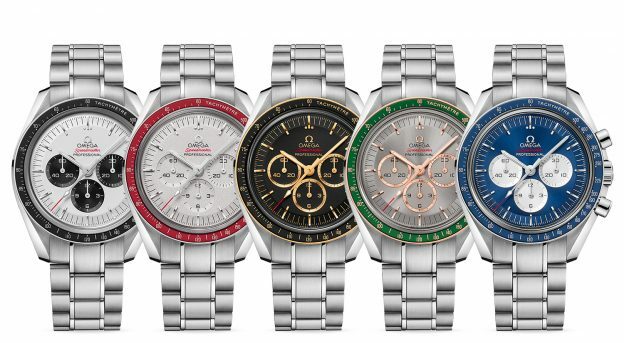 The renewed relationship between OMEGA and the Olympic Games is highlighted on each of the Torino 2006 Olympic Collection chronographs by the five interlocking coloured rings that so famously represent the Olympic Games. A strikingly innovative application of nanotechnology has enabled OMEGA to integrate this historic symbol with extraordinary precision and fidelity into the watch design. The coloured rings form the counterweight of the split-seconds or central seconds hand on the three chronographs, celebrating the Olympic Games and recalling OMEGA’s record of continuous innovation in both watchmaking and sports timekeeping. 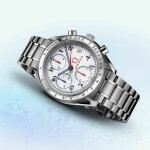 The role of OMEGA as Official Timekeeper to the Torino 2006 Olympic Winter Games is underscored by the “torino 2006” mark on the dial and by the Olympic rings symbol, the OMEGA name and symbol and the inscription “Official Timekeeper” stamped on the case back. An additional inscription on the case back enhances the exclusive character of the Torino 2006 Olympic Collection chronographs: “Torino 2006 Limited Edition”, followed by the engraved limited series number of the piece. The number of pieces in each of the three Limited Editions highlights the year 2006 and the Torino 2006 Olympic Winter Games: 01/26, 001/206, or 0001/2006. 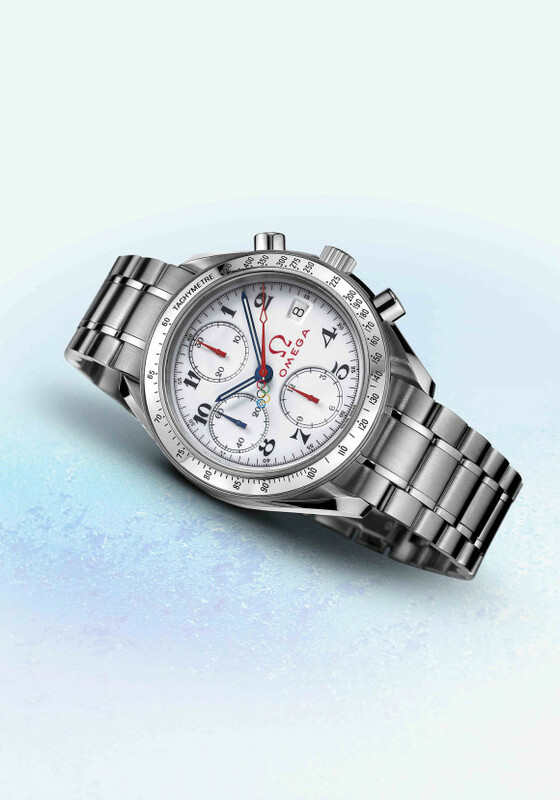 The centrepiece of the OMEGA Torino Olympic 2006 Collection is this Speedmaster Broad Arrow Co-Axial Rattrapante. The five coloured rings form the counterweight of the Rattrapante hand, and the “torino 2006” mark in blue at 12 o’clock underscores OMEGA’s role as Official Timekeeper. The dial’s facetted, luminous Broad Arrow hour and minute hands recall those of the original Speedmasters; all hands are blued, as are the facetted hour markers. A black tachometric scale is engraved on the bezel; a red pulsometric scale circumscribes the silvered dial. The hour marker zone and silver-edged counters are highlighted with a rhodium colour. Below the 12-hour totalizer and date window at 6 o’clock are the words “Lap Timer” in black. 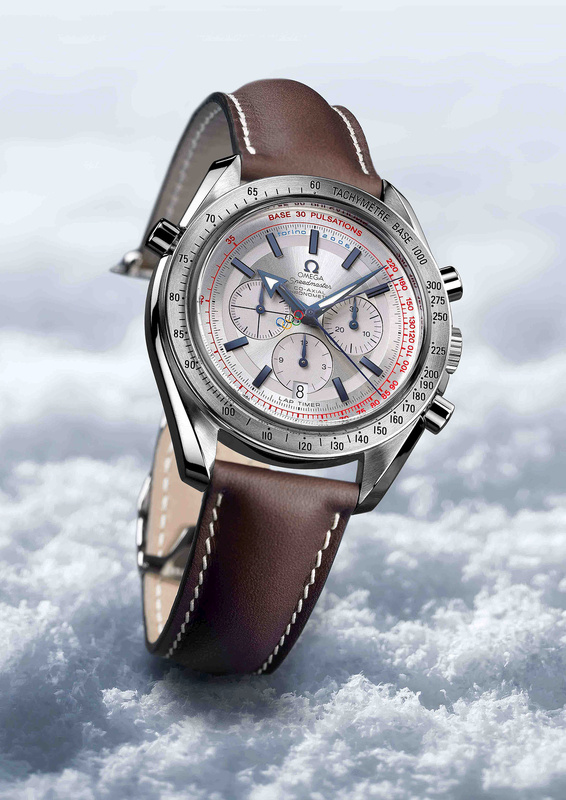 The Speedmaster case in polished steel features a sapphire crystal and is water-resistant to 100 metres / 330 feet. This Limited Edition Co-Axial Rattrapante is powered by the exclusive self-winding OMEGA calibre 3612. This officially certified chronometer (COSC) movement has a power reserve of 55 hours and is fitted with OMEGA’s proprietary Co-Axial Escapement and the OMEGA free sprung-balance. The split-seconds chronograph mechanism, controlled by a double column-wheel in blued steel, ensures precision start, stop and reset functions for the chronograph hand, the split-seconds hand and the hour and minute totalisers. A vertical coupling also ensures no jump or delay in the chronograph hand and split-seconds hand when the chronograph is started. A hand-stitched brown leather strap enhances the elegance of this superb timepiece. Engraved on the case back: Torino 2006 Limited Edition (01/26). 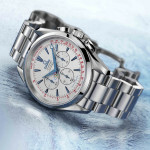 The second chronograph of three comprising the Limited Edition Torino 2006 Olympic Collection, this striking Seamaster Aqua Terra Column-Wheel Chronograph features the Olympic rings symbol on the counterweight of the chronograph seconds hand, and highlights OMEGA’s return to the Olympic Games with the official “torino 2006” mark in blue, which appears beneath the date window and hour totaliser at 6 o’clock. A pulsometer scale in red circumscribes the silvered dial. The facetted hour markers are blued, as are the hour and minute hands, which feature SuperLuminova inserts, and the accessory counter hands. The heart of the Torino 2006 Collection Seamaster Aqua Terra Chronograph is the OMEGA calibre 3301 self-winding chronometer-chronograph movement. With its 55-hour power reserve, official chronometer certification and column-wheel mechanism, this calibre is one of OMEGA’s most prestigious chronograph movements. The calibre 3301 is also fitted with OMEGA’s proprietary free sprung-balance without index, which ensures the stability of the watch’s performance over long periods of use. 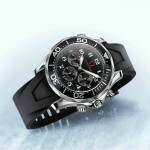 The Aqua Terra Chrono has a sapphire crystal and is water-resistant to 150 meters / 330 feet. The stainless-steel case, pushers and crown offer contrasting polished and satin brushed steel surfaces, as does the elegant satin-brushed steel link bracelet. Engraved on the case back: Torino 2006 Limited Edition (001/206). Completing the Limited Edition Torino 2006 Olympic Collection is this elegant Speedmaster Reduced, featuring the five coloured rings that represent the Olympic Games as the counterweight of its central seconds hand. Over the 12-hour totalizer at 6 o’clock is the Torino 2006 mark in blue. A black tachometric scale is engraved on the satin-brushed bezel, and a red pulsometric scale circumscribes the silvered dial. The black baton hour and minute hands with SuperLuminova inserts and the small seconds hand, also in black, give this chronograph a sportier look. 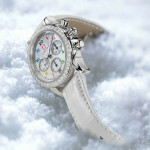 The central seconds hand and those of the 30-minute and 12-hour totalisers are rhodium plated, as are the hour markers. Contrasting satin-brushed and polished steel surfaces characterize the case, pushers, crown and each of the links in the steel bracelet. 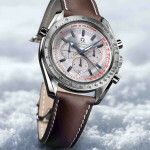 The Torino 2006 Olympic Collection Speedmaster is powered by the OMEGA calibre 3220 self-winding chronograph calibre, whose high-performance winding system ensures a power reserve of 40 hours. With its luxurious finish of special waves, circular graining and gold-plated engravings, the calibre 3220 movement is a perfect reflection of this Speedmaster’s stylish elegance. Engraved on the case back: Torino 2006 Limited Edition (0001/2006). 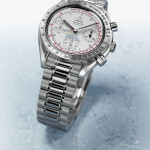 The OMEGA Olympic Torino 2006 Collection will undoubtedly appeal to collectors of classic timepieces, and in particular to those linked by design with the Olympic Games and the significant role of OMEGA as Official Timekeeper to the Torino 2006 Olympic Winter Games. To enjoy being to the fullest it is great to be healthy. How can remedies help up? Purchasing medications online can be a cost effectual idea, as long as you do it responsibly. DIFLUCAN, most popular of a new group of triazole antifungal agents, is existing as a powder for oral suspension. Certainly it isn’t all. If you’re concerned about sexual dysfunction, you probably know about viagra alternative and otc viagra. What do you know about viagra alternatives? Other question we have to is over the counter viagra alternative. A accepted form of sexual dysfunction among men is the erectile dysfunction. Once kidney disease will lead to erectile dysfunction. Prescription remedies can save lives, but they can also come with dangerous side effects. It’s essential to have in mind that not all medicaments are healthy. Do not give Cialis or any remedy to anyone under 18 years old without prescription. This entry was posted in Press Release, Speedmaster Automatic and tagged Co-Axial, Olympic, Rattrapante on February 1, 2006 by Dale Vito.